Same one-two ranking as last year. 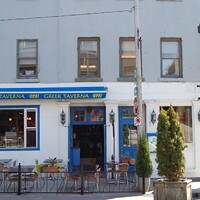 At Opa, chefs Joseph Majaess and Charlie Tsirigotis work at an open grill, putting out Greek salads with shiny fat olives and red onion and spanakopita and moussaka and whatever your little Hellenic heart desires. Big baskets of beautiful breads and strings of garlic get the juices flowing. Manager Fernando Lucas says the chefs work with real love of the food and that makes all the difference.